The Windows 10 Fall Creators Update version 1709, has added a new feature called, “Pick up where I left off”. When you restart your system, most apps that you had open in your previous session will reopen for you. This includes your web browser and MS Office files. Apps like The Movies & TV app don’t comply. 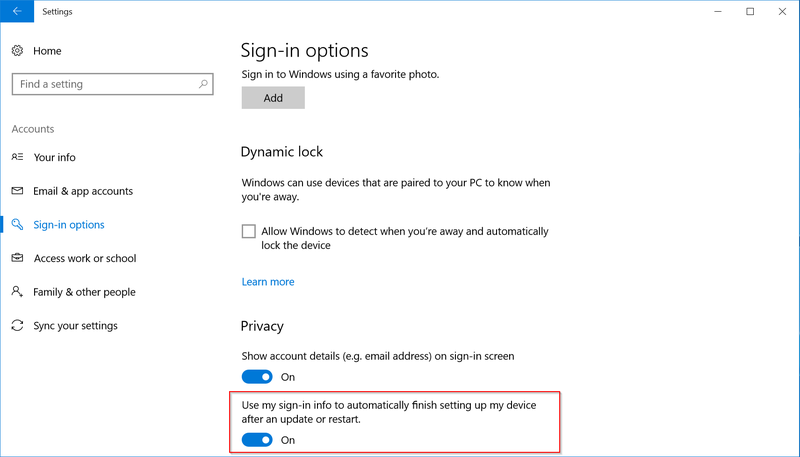 The "Use my sign-in info to automatically finish setting up my device after an update or restart" feature, use your sign-in info to automatically finish setting your device after an update has been extended to regular reboots and shutdowns. When you log in and initiate a reboot or a shutdown your computer, Windows will automatically setup your account after it’s has booted back up. This will help you sign-in faster and will restore your accessibility applications and any other application that has registered for application restart. Here’s how you can set disable this new feature. 1. Open Start Menu > Settings > Accounts > Sig-in options. 2. Turn Off Use my sign-in info to automatically finish setting up my device after an update or restart setting, under Privacy on the right side. 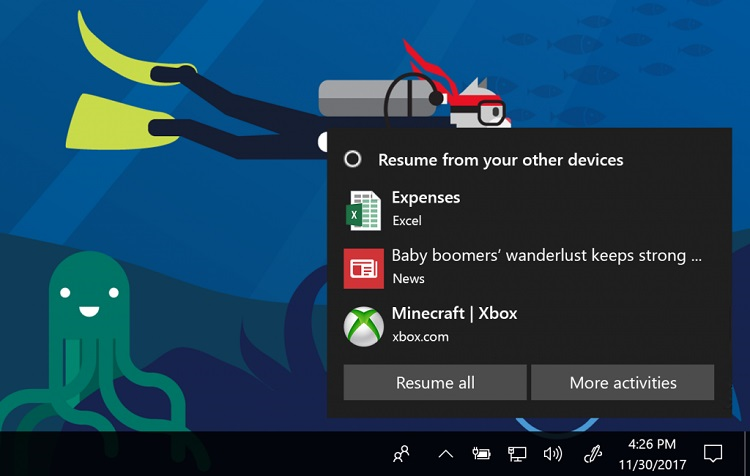 Turning off this feature will disable the Windows 10 feature to restore applications that have registered for application restart after you reboot or shutdown. 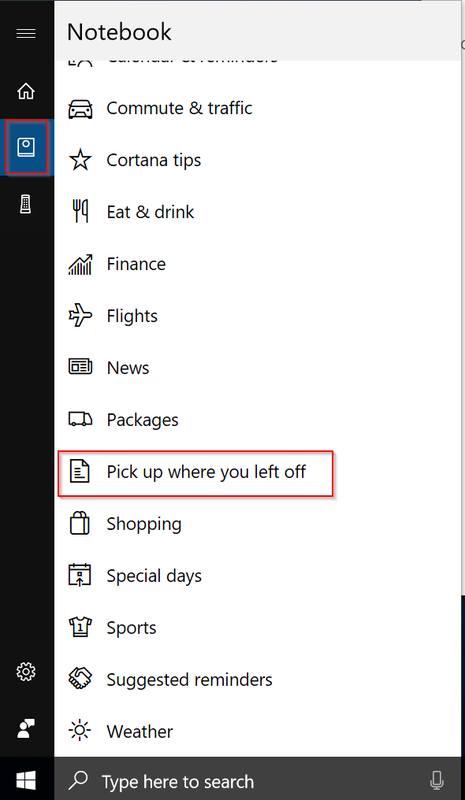 One of these newest additions to Cortana in Windows 10 Creators Update version 1703, is the "Pick up where I left off" feature. This feature will display quick links in the Action Center so you can quickly jump back into your Microsoft Edge session and SharePoint (or other cloud-based) documents after switching PCs. For example, if you were working on a PowerPoint deck on your laptop, when you later return to your desktop, a link to that deck appears in the Action Center. 1. Click on the Cortana icon or search box (Win+S) on the taskbar, click on the Notebook icon, and click on Pick up where I left off option. 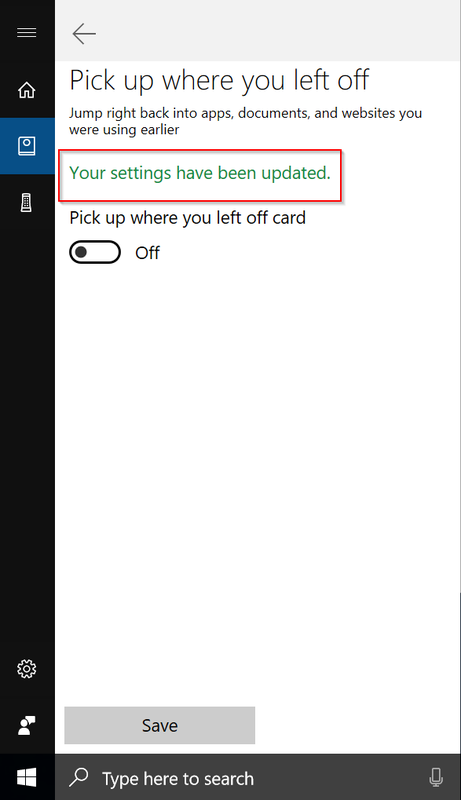 If you have Cortana enabled but you don’t see this option, open the Settings app. Go to Cortana and in the Talk to Cortana tab, select “English (United States)” under Cortana Language. Restart your system and the setting should appear. If you still don't see this option, you will need to change Windows 10 display language from Start Menu > Control Panel > Language. 2. 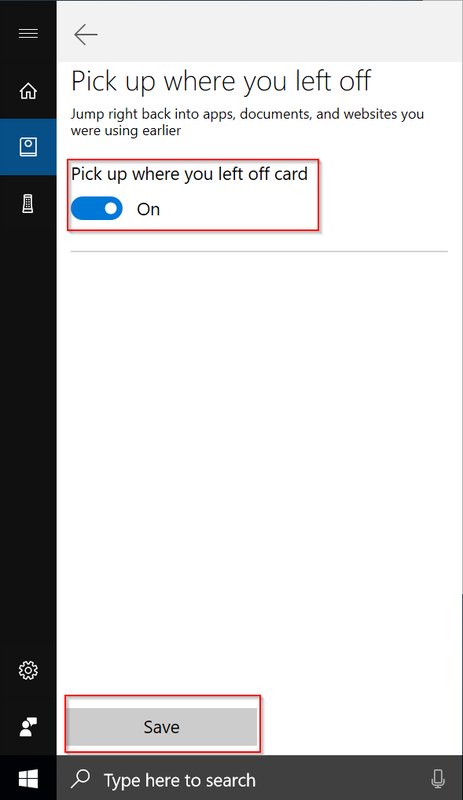 Turn Off Pick up where you left off card, and click on the Save button. You will now see a Your settings have been updated message to confirm your change has been applied.